Set the parameters and click OK. 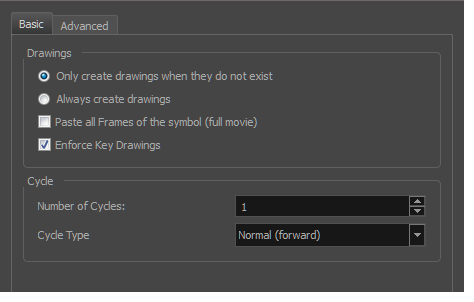 When adding exposures to a drawing layer, new drawings will be created only when drawings with the same name do not already exist in the destination. 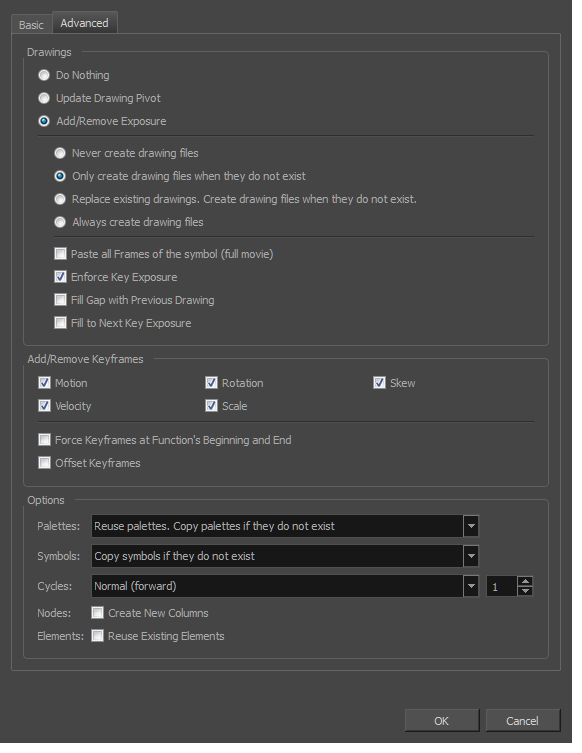 When adding exposures to a drawing layer, new drawings will always be created. If drawing files with the same name already exist, Harmony will create a new name for the drawing. Creates a key exposure on the same drawing. Revises the drawing pivot in the destination to use the same drawing pivot as the first drawing in the template. If you have a range of drawings selected in the destination, the pivot points of all selected drawings will be updated. When pasting functions, offsets keyframes from the function's last frame value by the values in the pasted function. This will continue the progression of a function instead of repeating the values. Do nothing: Does not create, overwrite, merge or link palettes. Reuse palettes. Copy palettes if they do not exist: Palettes in the destination drawings are left as they are. Copy and overwrite existing palettes: Overwrites destination palettes with the palettes from the source drawings. Copy and create new palette files: Creates new palette files, placing them at the same relative environment and scene level as the source. If the palettes in the templates were stored at the environment level of the source scene, the paste operation will place the palettes in the environment level of the destination scene. Copy and create new palette files in element folder: Creates new palette files in the element folders of the destination scene, rather than in the same relative job or environment. Copy palette and merge colours. Add new colours only: Adds new colours to the destination palettes and ignores colours that are the same in the two palettes. Copy palettes and update existing colours: Adds new colours to the destination palette and updates duplicate colours in the destination with colour values from the source. Link to original palettes (colour model): Links the colour palettes in the destination scene to the palettes in the source. Use this to link drawings to the palettes in a colour model. Copy scene palettes and merge colours. Add new colours only: Adds new colours to the destination scene palettes and ignores colours that are the same in the two palettes. Copy scene palettes and update existing colours: Adds new colours to the destination scene palette and updates duplicate colours in the destination with the colour values from the source. Create New Columns: A new column is created when you copy and paste nodes from the layer in the Timeline view. If the layers are linked to function curves, the function curves, drawings and timing will be duplicated. Reuse existing elements: Lets you paste existing elements without creating new ones. This should be used only when pasting within versions of the same scene.